With a stay at The Algonquin Hotel Times Square, Autograph Collection, you'll be centrally located in New York, steps from Town Hall and minutes from Broadway. 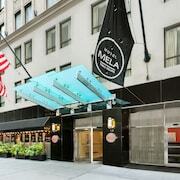 This 4-star hotel is close to Times Square and Rockefeller Center. Make yourself at home in one of the 181 air-conditioned rooms featuring iPod docking stations and minibars. Your room comes with a pillowtop bed. Wired and wireless Internet access is complimentary, while 42-inch flat-screen televisions with cable programming provide entertainment. Private bathrooms with showers feature designer toiletries and hair dryers. Featured amenities include complimentary wired Internet access, a 24-hour business center, and limo/town car service. 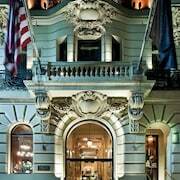 Planning an event in New York? This hotel has facilities measuring 4953 square feet (460 square meters), including meeting rooms. Self parking (subject to charges) is available onsite.